Among other things, mastering digital transformation requires a combination of two distinct but related dimensions – digital capabilities and leadership capabilities. Digital capabilities are acquired by investing in technology-enabled initiatives to change how the company operates. You should, among other things, have an Innovation Lab or even better have an Innovation Culture permeate the entire organization. You should be willing to invest in and experiment with state-of-the-art technology. Leadership capabilities include the ability to create a vision to shape the future, governance, and engagement to steer the course and relationships to implement technology-based change throughout the organization. You should be able to decide when to allow niche projects and when to demand wide-spread rollout. You should always strive to balance efficiency and experimentation. All IT is digital, and all things digital require IT. Therefore IT processes are hugely important in a digital transformation. 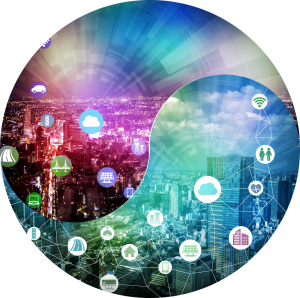 Like Yin and Yang, IT Governance and Enterprise Architecture are complementary concepts that interact to form a dynamic system in which the whole is greater than the assembled parts. Governance is about “doing the things right”, Enterprise Architecture is about “doing the right things”. IT Governance without Enterprise Architecture is like getting the direction and distance to go but not knowing the location of paths and pitfalls i.e. having no map. IT Governance without Enterprise Architecture tend to get quick results from a holistic perspective look like a patchwork carpet with no general idea and a lousy design. Enterprise Architecture without IT Governance is like having a map but not knowing where you are and where you are going. Enterprise Architecture without IT Governance typically ends being an ivory tower with no benefits to the organization. Trying to implement a complete set of IT Governance processes, roles, and responsibilities simultaneously with a full set of Enterprise Architecture guidelines, principles and standards will at best take a very long time before you see any benefit. But usually, the endeavor will fail before you realize the benefits.